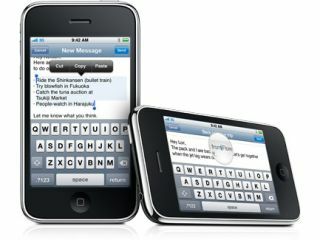 Apple has announced its iPod touch and iPhone users have downloaded over two billion applications from its App Store. This is a frankly startling number, especially when you consider the App Store was only opened for business in July 2008. The number of applications downloaded hit 300 million by December that year, crossed the billion mark in April 2009, and had hit 1.5 billion in time for the App Store's first anniversary. There are more than 50 million iPod touch and iPhone users in the world at the moment, meaning Apple's library of 85,000 applications has a pretty broad audience. "The rate of App Store downloads continues to accelerate with users downloading a staggering two billion apps in just over a year, including more than half a billion apps this quarter alone", said Steve Jobs, Apple's CEO (you may have heard of him before). "The App Store has reinvented what you can do with a mobile handheld device, and our users are clearly loving it". The App Store is also starting to segment too, with some applications only working on the iPhone 3GS thanks to advanced hardware. But that doesn't look like it will stop the rate of downloading from the App Store, which will probably cross three billion by 2010.